After so many months of trying I finally got my new http://www.mrakesh.com.np/ domain got working. So, here I am to share how I did it so that you might not waste 6 more months just to do what could be done in a week or less. Here are the procedures I have been through. First of all you need to have a domain name. If you want a ".com" ".info" etc domain you need to purchase that domain. 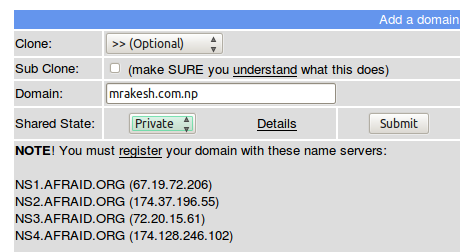 So, instead you can use ".com.np" domain which is free for Nepali Citizen or Organization of Nepal. You can get more information about domain registration at MOS website. This is what I did. Since my blog is purely for personal purpose I have to choose either my name (i.e. one that is in your citizenship) or in my case rakeshmanandhar.com.np was already taken so I have to choose either mrakesh.com.np or rakeshm.com.np (where 'm' stands for my sir name). So, I preferred "mrakesh.com.np". Since we still need to host the blog at blogspot.com we only need domain hosting. (i.e. just redirect the blog to the new domain) So, for this we have to use some free domain hosting service for which I chose http://freedns.afraid.org/. Now open the link and register/sign up. 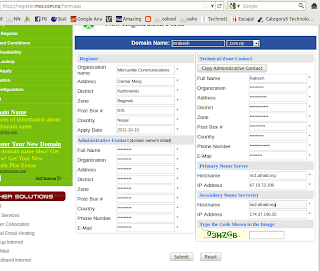 Then go to http://register.mos.com.np/form.asp and then fill up the form with your personal information and when you reach "Primary Name Server" fill the form as in the image shown. And then write and application letter and drop it in their office located at Durbar Marg, Kathmandu or fax the letter with a photocopy of your citizenship. Now, in 2 days your domain will be registered and you will be notified by email. So, the first step is complete and now we still have to configure in freedns which you earlier signed up. Login to http://freedns.afraid.org/. 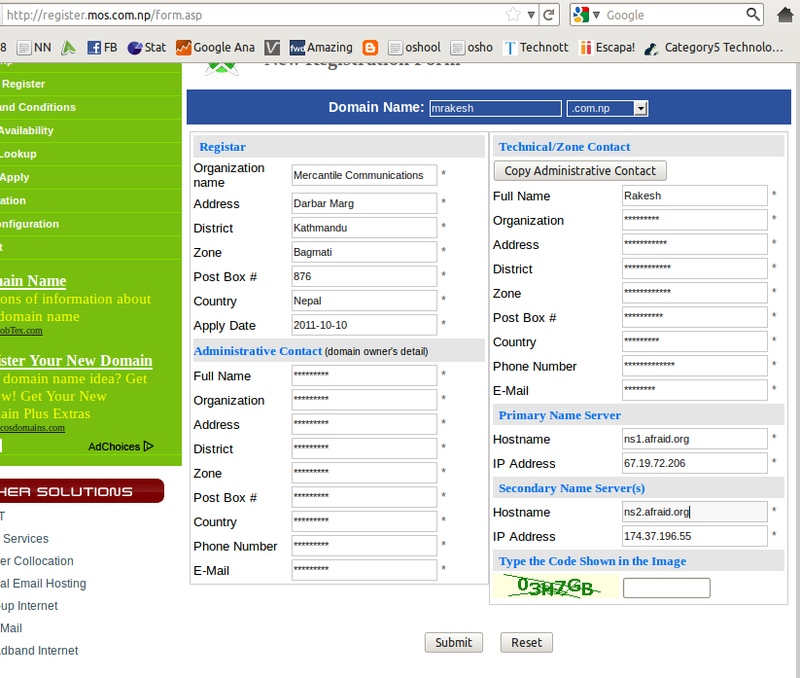 Then click 'Domains' on left bar and click 'Add a domain' as in the following image.Then in domain field type the domain name you registered with earlier in Mercantile Office Systems; in my case "mrakesh.com.np"; then click submit. After that select 'CNAME' as type and put 'www' in Subdomain and 'ghs.google.com' in Destination as in the following image. Now you have to wait at least 48 hrs. to 2 days for your dns settings to work. Now login to your blogger and then put your registered domain in blogger's settings in Publishing. That's all and you now have a new domain set up for blogger. I've clearly written with snapshots of all the process that I've been through and worked for me. What's your domain name as registered through mercantile.